Well, Maya Angelou’s students were on to her and what an egomaniacal creep she was. I’ve already told you what a racist, bigoted, anti-American, anti-Semitic, anti-Israel Marxist the late Maya Angelou was. But, predictably, she sucked as a professor, too. The pretentious Angelou, who never went to college (and may not have even graduated from high school), “taught” (if you can call it that) English at Wake Forest University. Check out what her students had to say about her (one of them noted that she often began class by speaking in Arabic–strange . . . for an ENGLISH class). I’ve posted some of the comments from Angelou’s students, below. (Thanks to Facebook Friend Jeanette Victoria Runyon for the tip. Join me on Facebook.) 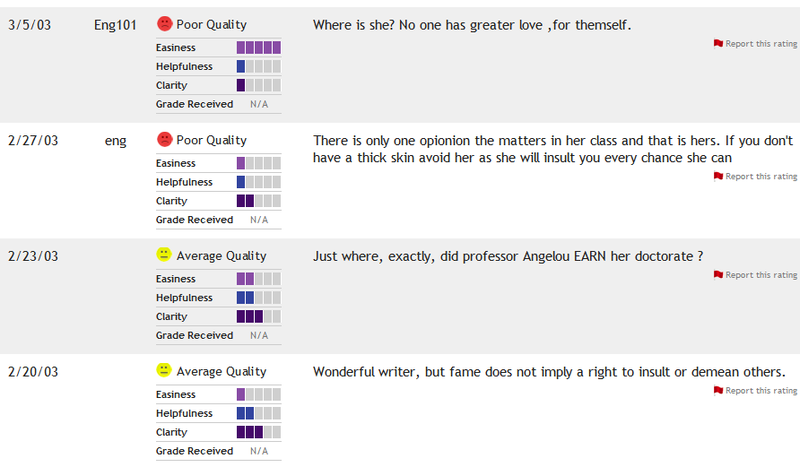 Check out what students had to say about “Professor” Angelou the narcissist . . .
Click on the Images to View & Read Them in Their Entirety . . .
By the way, students could also rate Angelou on “hotness.” She didn’t rate at all in that category. Stunning. Like I said, the woman was ugly inside and out. Thank you, Debbie. I knew this was going to be the case, but you proved it. Of course she’ll be idolized by the main stream press for no other reason then her ethnicity. I wonder how many people have actually read any of her works. Lol @ HK, thats a good one. I’ve read a few of her works, and did not find them interesting. I know nothing of her past, her background but was taught that she should be revered. So when I see articles as D.S which goes in another direction, it makes me ask questions, that’s all. Look, I didn’t enjoy her work the little I read of hers, and now it seems countless students thought she was very insulting. Good job on the screen print. The link has been scrubbed. She lived in my neighborhood in Winston-Salem. I saw her shopping at the Harris Teeter grocery from time to time. Not friendly at all and I never thought enough of her to say even a slight, ” Hi”. Wake Forest is a snobby University with the same uber-lefties as Harvard and the others. Wake Forest? Leftist? I thought that was a Southern Baptist school. It has not been affiliated with the church for a long time now. Sometime in the late 1980s when we lived in the city, the Baptist Church gave up what control they had with them. My son attended WF for two years after serving in the Army for 4 years then transferred to a small religious college in Georgia where he graduated and then went back into the military. As far as WF is concerned my son hated that his professors in History were as LIBERAL as possible. I just cannot discuss the Anthropology department that my son laughingly called a little “Sodom and Gomorrah”. JUST JIKES! I tell you! I didn’t think she went to college either. So how do you get a phd? What a fraud. 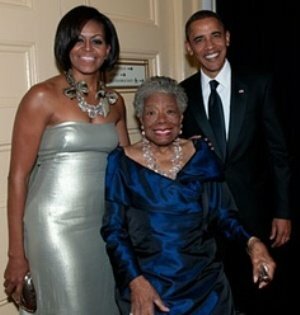 Similar to another overrated,untalented Black racist “writer” and “poet”,LeRoi Jones/Amiri Baraka( Who also passed away this year,in January ),Maya (Arc)Angelou(cifer) is one of the greatest triumphs….of White Leftist Guilt Masochism. Let us call it what it is… TOKENISM. Damn! I am in the wrong racket. I need to get famous by being anti-American,anti-semitic, Marxist, and writer of bad poetry. I can then get to make speeches for a lot of money and even teach at a university for six figure salary. I find it ironic that the people that derail “capitalism” are usually the first to benefit it. I wonder if she did stay in Africa would she have been this (in)famous like she is now? If I was a parent and my child had to attend this dreck of a class, I would be not to happy at the tuition cost. This is why I tend to be a bit more respectful toward college professors of the sciences(chemistry, physics, mathematics) for even though many are leftists liberals, they still have a rational mind compared to professors of ethnic studies. So what’s the URL for WakeForest-Orwell-MemoryHole-Angelou? way to make this page display correctly on google chrome, the second most popular browser. Great job. Well, I for one would want to encourage Chrome users to visit if they are anything like our friend. So she actually started teaching? For awhile there, she didn’t even bother to show up for the classes she was hired to teach. i would’ve responded to her in german. I never heard of her until she died, and then I was curious so I did a bit of research. She certainly seems like just another pompous minority, looking down her nose at everyone. And yes, I’m quite sure the Obamas just loved her. Too bad, so sad……. Buh-bye. I first heard of Maya Angelou when she was invited to speak at my college’s Commencement (I had voted for Jane Goodall). Since I don’t remember anything from her speech, I guess that the only appropriate word to describe it would be “unmemorable.” I recently picked up the book to which she had given the poetic title, “I Know Why the Caged Bird Sings.” It rather seemed to me the book could have been the work of a creative writing student and that it badly needed some editing. Her use of adjectives, for instance, seemed to be totally random (she probably had a long list of adjectives from which she chose one by closing her eyes and pointing). Horrible metaphors and similes, awkward wording, trite, pretentious writing, and altogether an example of bad writing (in my very humble opinion). I thought the dialogues were the best part of the book. As for the content, Maya Angelou came across as mean, vindictive (purposely breaking her employer’s prized dish and gloating over it, slapping her father’s girlfriend, using demeaning epithets to describe races and people), arrogant, narcissistic, and ungrateful. I also find it astonishing that as someone who is very open about her loathing of Whites she’s such a name-dropper of European (White) writers that she boasts of having read all her life, as well as White American and English actors and actresses that she and her brother enjoyed mimicking to the point where they adopted their way of speaking. Oh, the hypocrisy. The reason I googled Maya Angelou’s name (and thus found this website) is that I just saw “American Masters” on PBS and it happened to be the biography of Maya Angelou. My opinions of this woman were affirmed during my viewing of this 2-hour show and now I discover that she was also an antisemite and hater of Israel. Somehow I’m not surprised. There was a great article about her position at Wake Forest about 20 years ago in the Weekly Standard. Someone looked up where her “office” was supposed to be and they tracked it down to a supply closet in the Humanities building. Maya was a terrible poet, plain and simple. Actually, from what I can tell, she had no skills whatsoever. That being said, the commenters in here represent the drugs of society.